So what’s the idea behind the orangutan reference? Well, for many years now my family have often likened me to an orangutan. I’ll explain why in a moment, but I’m pleased to say it’s not because I look like a hairy ape! Well, I don’t think that’s why anyway? You see, a special attribute of an orangutan is that their arms are considerably longer than their legs. In fact quite a bit longer. Whereas in humans our arms and legs are generally the same length. A common fact in humans is that if we stretch our arms out to either side then the distance between our fingertips will be equal to our height. Well there or thereabouts. But with me this isn’t the case, and nor is it with orangutans. Orangutans stand a rather short 5 feet in height and I am just under 6 feet 4 inches tall. Their armspan however is a Mr Tickle length of around 7 feet, considerably more than their height, whereas my armspan reaches out to 6 feet 11 inches. Now I don’t think its particularly freaky but others can clearly see a resemblance between us. Oh and before you ask, yes my arms are indeed longer than my legs and it’s not just because I have a really short body. So there you have it, nice and simple. To be honest I’ve probably always encouraged it of late. The matter of liking me to an orangutan has increased my interest in them immensely. 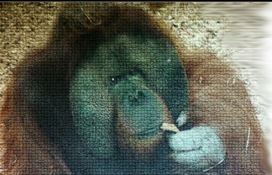 I love orangutans. They are amazing creatures, very intelligent, thoughtful, wise and caring. So pretty much like me then! !